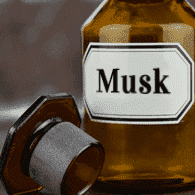 What is a musk style fragrance oil? Hundreds of years ago, perfumers learned that certain animal pheromones greatly enhanced the tenacity of their perfumes. They were considered powerful aphrodisiacs since that is why animals produced them. While "musk" has become a word to describe many animalistic aromas, it was originally obtained from the musk deer. Other animal pheromones were castoreum from the beaver, civet from the civet cat and ambergris from sperm whales. Please note: Ajne is cruelty free and vegan. All musk ingredients are created by mimicking the aromas with proprietary combinations of plant ingredients. Ok...we should probably begin with a disclaimer that this is pretty ..
Ok...we should probably begin with a disclaimer that this is pretty much a love potion - a secret elixir of powerful aphrodisiacs. It unfolds with a hint of seductive rose, luscious cacao, rare smoky myrrh, frankincense, sandalwood and Jane's enchanting blend of natural musk. The scent is equally suited to women and men.Click here to check out celebrities that selected our Adonis. To see it in magazines click here.Jane's inspiration: One year, prior to Valentine's day, Jane was inspired to create a his and hers set of grand aphrodisiac fragrances. For her she created Aphrodite. So it only made sense to craft its scented soulmate Adonis. The ingredients of Adonis are reputed to support the sacral and heart chakras. So if you are leaning toward fragrance oil roll-on, we suggest carnelian or jade. These stones vibrate with the same energy resonance as the plant oils in the formula. So together they magnify and enhance the energy. Carnelian attracts fun, romance, p..
A seductive mixture of natural aphrodisiac plant ingredients that m..
A seductive mixture of natural aphrodisiac plant ingredients that mimic the animalistic scents of civet, castoreum, ambergris and musk. The scent is equally suited to women and men.Click here to check out celebrities that selected Adler. To see it in magazines click here.Jane's inspiration: Jane set out to create an ultra-seductive, animalistic scent with all the aphrodisiac elements. Of course, these ingredients were once derived from animals. Yet Jane mimics these notes with a secret plant-derived mixture. The ingredients of Adler are reputed to support the sacral chakra. So if you decide on a fragrance oil roll-on, we suggest the carnelian stone. Carnelian vibrates at the same energy resonance of the plant oils in the formula. Together they magnify its power to attract prosperity, creativity, romance and fun.Contains: Our proprietary fragrance composition of 100% natural essential oils and absolutes distilled from genuine flowers, fruit, citrus, seeds, gra..